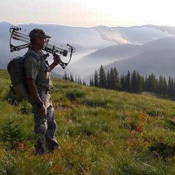 An outdoors columnist in Central Texas has an interesting take on elk. On a recent trip to Chama, New Mexico, he stated, “The animals, superb athletes, test humans’ stamina and patience.” The animals he referred to are elk, and more specifically, the elk on Jack Brittingham’s Rancho Lobo that butts up to the Colorado border. The slightest scent of a human will send an elk scurrying. And that’s what happens to our hunter and his guide. Just when they thought they were getting close, the herd moves out and disappears into the trees. Not long afterwards, another bugling male draws the hunters in. With the conditions not right, the hunters begin to return to camp. But they stop short as the bull commences to beef up his bugling. In the valley below, another bull approaches. A fight is about to ensue, all over a bunch of females. The cows begin to mosey away, and that might be our hunters’ opportunity if the bugling bull follows them, for that would bring him into bow range. In moments, the bull causing all the racket follows his cows down the trail that leads him right in front of the hunters. Bow drawn, the bull emerges in a clearing 25 yards away. But today’s not meant to be. The animal has positioned himself so there’s no clear shot. His next move takes him into the trees. That was enough. The elk wins this round. It’s time to head back to camp and rest up for the afternoon.